Plumbing is not exactly a glamorous topic. But its pretty dang important. Last night I came home, and Kyle texts for me to come up to the house. The plumber had installed the kids bathtub that day. Kyle had been having all the dealings with the plumber, and his instructions were we just wanted a white tub in the kids bath. Pretty simple. Ok, now I walk into the bath and there is a tub, and its white, and it has some design thing on the front. Ok, I am not a design person. I just wanted a plain front. So I…..have a freak-out. This is the FIRST piece of what I consider the inside design of the house…and I hate it. 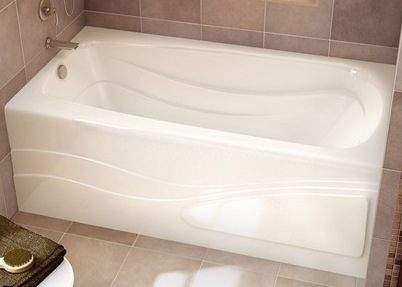 And to make it worse, I can’t believe how upset I am over a tub. You bathe in it…that’s all. A shower curtain will cover the front of the tub, who cares that some design is on it. I said all of this to myself…and to Kyle. But it didn’t help. I hated the tub and flabbergasted about how Kyle and the plumber just assumed any white tub was fine. ok I cannot rant about that tub anymore, that’s the jest of it and its all solved. Because my sweet husband told the plumber “that tub isn’t gonna work” and the plumber said no big deal, have her go pick one out. So I did, and it will be here in 10 days. Okay. Solved. Okay, I have some regular toilets from home depot picked out that are Kohler I think for like $174 each. Preferably I’d like them to be cheaper. The toilets at this other place were over $200 and up! 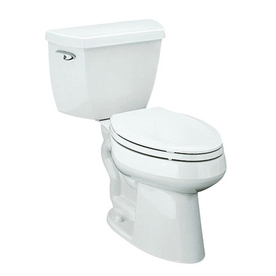 I don’t understand why a $200+ toilet is way better, is it a flushing thing? the amount of water. Its white, porcelain and you visit it a few times a day. And yet I’m needing to decide if I want regular height, or tall…what shape tank do I want…a handle to flush or a fancy button thing. When did toilets get complicated?! And then there is my kitchen sink. I thought I knew what I wanted, but then I didn’t. And now I’m just confused. I am trying my hardest to figure out what pieces to splurge or invest in and what others its okay to go cheaper on. This is how budgets get out of control. So, I have selected a stainless steel apron front sink by KRAUS, its $629 and includes a grate for the bottom, faucet, and a soap dispenser. Great deal. But now I worry about scratches. I get SS scratches, but I hear with an apron front that maybe the buttons of pants, zippers, etc will scratch the front. So then there are porcelain apron fronts, more $$ of course. I love our sink, and I hate our stainless appliances. That pretty much sums up why we went with porcelain! When we remodeled our last 2 homes, we went with stainless sinks despite my resistance the 2nd time around. I think Nick finally caved for this house since if we are being real he isn’t the one cleaning anyway! I always felt like keeping a stainless sink clean i.e. no water spots was impossible. The thought of having a stainless surface for the farmhouse look was something I was completely not on board with. I would be battling water spots inside and on the front. Our white porcelain sink is super easy to clean. I just use Bar Keepers friend for a quick scrub and multi surface cleaner on the front when I need to which isn’t very often. I hope that helps. I feel like this is a very passionate email about all things stainless. Ha! Have fun building! We got a screaming deal with Kohler so really I just pointed and picked. Having had lived with our ss sink now for 3+ years it’s just fine. For sure SS scratches easily but it only bothers you in the beginning where you see it. 3 years later there are so many scratches it all blends together. Porcelain also scratches but I guess you just have to deal with it. 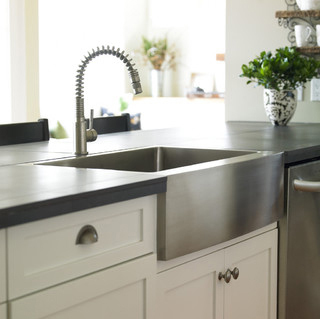 The other things I don’t love…I picked a huge single tub sink. While I love that’s it’s a single tub it’s almost too deep (8.5 inches to be exact). I really have to bend over the sink to wash dishes, etc. I wish I would have picked something more shallow. The other “meh” is I chose a very angular, modern sink. It has true 90 degree angles where the bottom meet the sides. As a result I have to either use my sprayer or my hand to sweep all the food to the disposal. Food and muck stick in those hard 90 degree angles and I have to take a tooth brush to scrub the corners. Next time I’ll get a sink with curved/rounded edges. SS steal or porcelain are sixes to me. I don’t prefer one over the other but I do LOVE the look of a porcelain apron front farm house sink. Boy, I never knew I had such an opinion on my sink. Hope that helps. Let me know what you choose and how you like it! So now I’m asking the reader world, what are your thoughts on all that is plumbing?